The words you have played so far are shown in alphabetical order in a panel in the middle of the screen. Any words that are classed as rare are in italics. A word that uses all the letters of the puzzle is shown in BOLD CAPITALS. All the shorter words played are shown in lower case by default, but there is an option to have them displayed in CAPITALS too, as described below. Define: With this option selected, you can click on any word to see a dictionary definition. Most of the definitions are from Wiktionary, the free dictionary compiled by thousands of volunteers. Drag: Selecting this option allows you to drag a word back to the rack where new words are created, so you can extend or modify it to make a different word. Unfortunately, this does not work on some touch screens. Caps: Select this and all the words you play will be displayed in CAPITALS. This may help in quickly distinguishing them from the words you missed when you are looking at the solution. 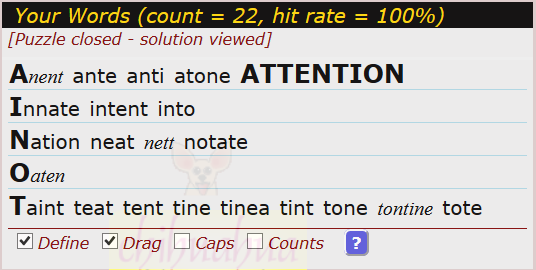 The words not played are all shown in lower case. If you have selected the Counts option, there should be a List by plays button. Click this to see a list of the words of the puzzle in order of the number of players who played each word. Click the Solution button underneath the word panel to see the words you didn't find. For some puzzles you can't look at the solution until the puzzle closes - in these cases the Solution button is not visible. The words you didn't find are displayed in red lower-case letters. By default the solution does not show words you missed that are classed as rare, only the "common" words you didn't play. To see all the rare words as well, click the Show all? checkbox at the top right of the word panel.